Unmet demand is increasing community stress. Housing has always been one of the biggest issues for clients at Citizens Advice Reigate & Banstead. In the past year problems brought to us have gone up by more than 15% on 2014. The main cause is that the number of homes available to people on low or middle incomes has continued to fall. Financial pressure on social landlords leading to more evictions. The result is growing stress in parts of the community. Families are forced to leave the area and households are separated. Vulnerable people are particularly at risk. Official figures last month showed an upturn in the share of all households in owner-occupation. 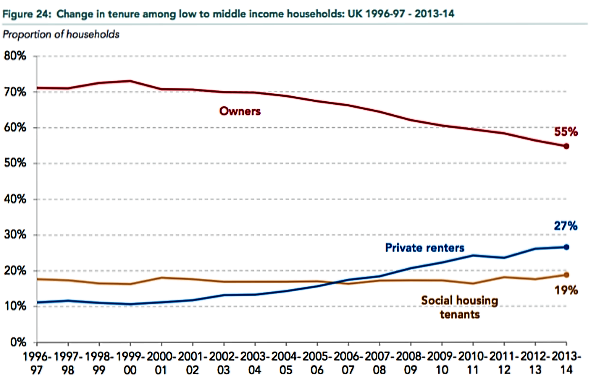 But the trend for those on low and middle incomes is consistently down – see chart. Many experts feel the upward curve in private renting is set to continue. Source: Resolution Foundation based on DWP Family Resources Survey 2013-14. ‘Living Standards 2016: The experiences of low to middle income households in downturn and recovery’ February 2016.